In this episode, Jasmine is incensed by the implication that she doesn’t understand what it’s like to be a street rat, and decides to disguise herself as a thief to prove that she does. 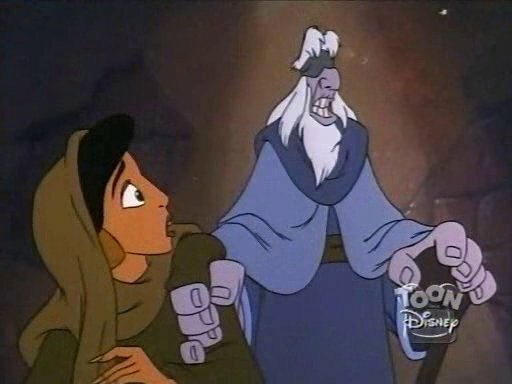 As a result, in the typically magic-filled world of Aladdin, she is turned into a rat, and must try to get back to the palace so Genie can reverse it. 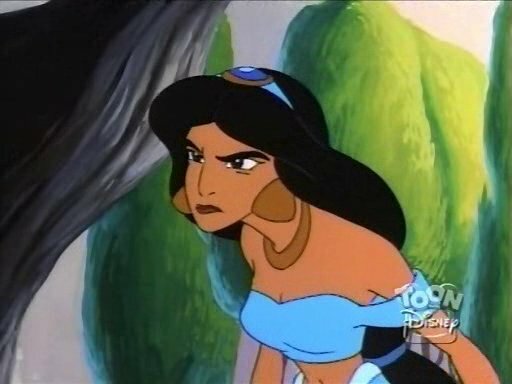 Jasmine get unreasonably angry when Genie points out that she is a princess, not a street rat. Why does Jasmine want to be a thief? Yeah, she says she wants to better understand Aladdin, but this is a bit much. She knows, or should know, that she’s not really familiar with the plight of the common man in Agrabah, so her anger at people pointing this out is a bit mystifying. Jasmine will end up getting a bit of karmic retribution for her arrogance, though the show paints in more like a learning experience than punishment, and in the end, Jasmine doesn’t seem to feel like she brought this on herself, either. When a guy that looks like this gives you a warning, you should listen. Indeed, just after stealing the mirror, Jasmine seems perfectly pleased by her cleverness and admires her smiling reflection. The scene where the kids mistake Jasmine for the “magic holiday rat” is just odd. I guess the writers couldn’t come up with a better joke, and you certainly can’t let a minute pass on a children’s show without some lame attempt at humor. When Jasmine is finally restored, at the end, she is inexplicably angry at Aladdin. Yeah, you could pass it off as anger at him for not recognizing her when she was a rat, but that’s just quite unreasonable. She treats the rat better than Aladdin. Ultimately, the only thing Jasmine seems to have learned from this episode is that poor people exist. She doesn’t accept any responsibility for her actions that led to the events of the episode, and I imagine she’s quite forgotten her earlier claim that she’d come back and pay for the mirror.